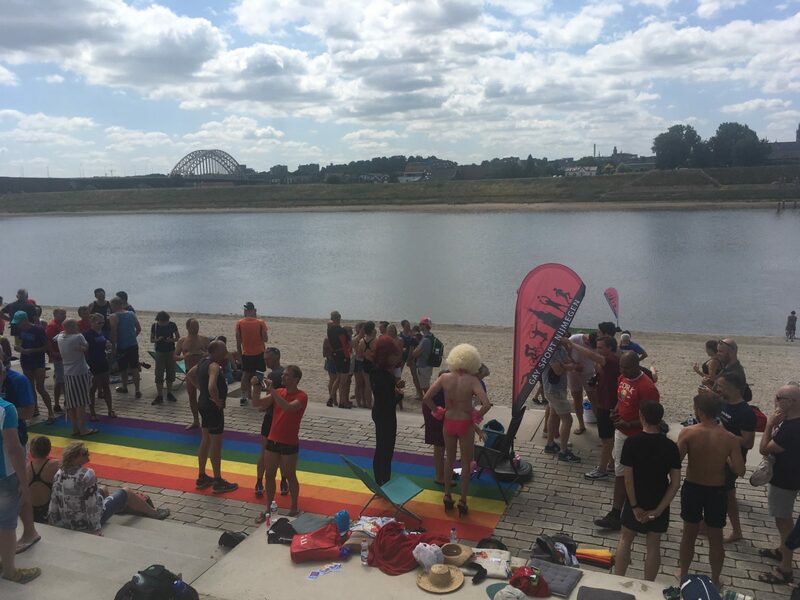 Gay Sport Nijmegen and Gay Swim Nijmegen Spetters will organize again an open water swimming event for LGBTI-swimmers in the Netherlands as part of the Pink Summer Sports Tournament on Sunday afternoon 23rd of June 2019. We hope it will be as succesfull as last year edition. The open water swimming event will have several distances (750, 1500 and 3000 meter) and the first contest will start around 1.00 pm. The Spiegelwaal is a secondary channel of the river Waal and was built as part of the flood protection programme. With the Spiegelwaal Nijmegen has created a new urban park and the new bridges received awards for design and use of materials. The Spiegelwaal will also be the finish point of the Pink Summer Sports cycling trial and the Pink Summer Sports long-distance road running.